Cavity Wall Construction - its Advantages, Disadvantages. In this article, you are going to learn that what is a cavity wall its advantages, disadvantages, and construction of cavity walls in details. Special Points to be Observed in Cavity Wall Construction. Cavity walls are those which are constructed in that way that an empty space or cavity is left between the single wall. They are also known as Hollow Wall. Cavity walls are two walls constructed as a single wall. A little space is lifted between these two walls for insulation purposes. These two walls having little space between them for insulation purpose are known as leaves of the cavity wall. The outer wall is called an external leaf, and the inner wall is called an internal leaf. The empty space or cavity size should be in between 4 to 10 cm. The internal and external leaves should have 10 cm thickness. These two leaves of cavity wall are interconnected by links or metal ties for a strong bond. The use of cavity walls is common in cold countries. However, one should know how they are constructed, and why. 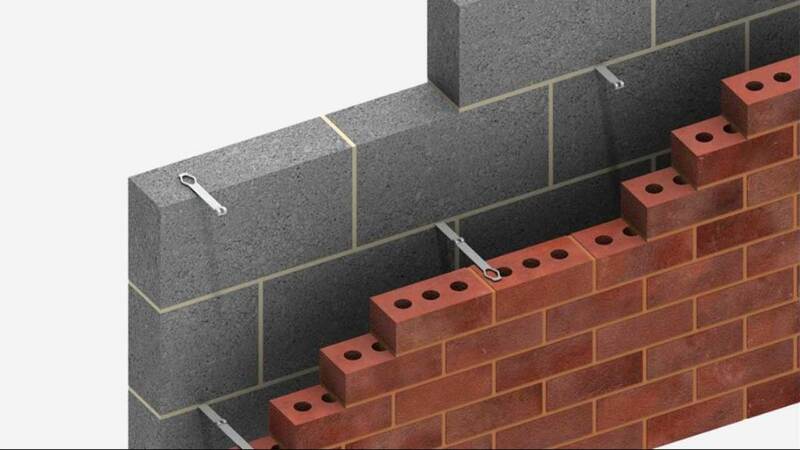 The normal 275 mm (11 inches) cavity wall which is suitable for buildings not exceeding two stories in height, consists of two half brick (4 – 1/2 inch walls with 2 inches cavity). Cavity Walls are useful in two ways. Firstly, the cavity prevents the dampness from the outer leaf percolating into the inner leaf. Secondly, they provide excellent insulation from heat and sound. However, when used in tropical countries, sufficient precautions must be taken to see that they do not become breeding places for lizards and insects. The inner leaf is found to take a greater portion of the imposed load transmitted by floor and roof. 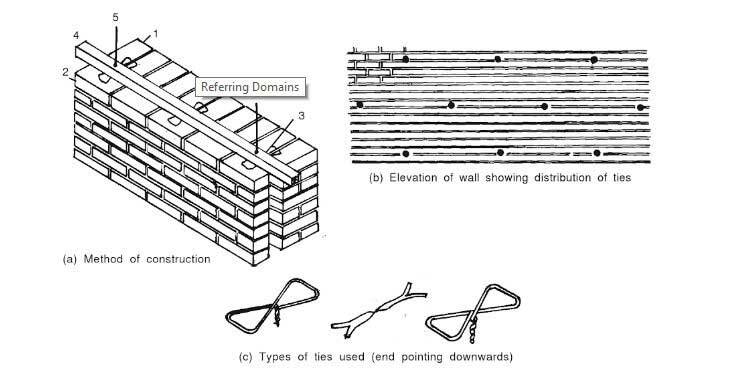 Hence, the two leaves of the wall are bonded together with ties (wall ties) usually placed 900 mm apart vertically and 450 mm horizontally in every 6th course staggered. This gives more than two ties per square meter. These wall ties are made from mild steel wires of 3 to 4 mm diameter or MS bars and fabricated to shapes as shown in the below Figure. They are dipped in hot tar and sanded or made from galvanized steel to prevent rusting. In very important works, copper may be used. Wire ties are placed with their twisted end down to allow water, that may seep inside, to drip down in the cavity. The bond to be used for both the leaves, when the thickness is half brick, is the stretcher bond. Where the inner leaves are made thicker for carrying heavy loads. English bond can be used for that part. Cavity walls require considerable care in design and supervision. Otherwise, their efficiency as insulators against driving rain, heat and cold will be seriously impaired. Particular care is required at the top and bottom of the walls and around openings in the cavity wall construction. Read Also: Test for Compressive Strength of Bricks, Absorption, Efflorescence & Size. 1. The cavity should extend to 15 cm below the damp-proof course level. 2. Below the ground level, the walls are built solid, or preferably the cavity should be filled up to 15 cm below the damp-proof course with fine concrete. 3. Under no circumstances, should the DPC be laid to the span of one leaf only. It should cover both leaves of the wall. 4. The upper part of the wall where it ends should also be built solid for two or three courses below the wall plate or roof line, to stiffen the head of the wall and distribute the load over both leaves. 5. The wall ties must be kept free from mortar droppings by means of a timber batten suspended in the cavity and raised as the work proceeds during its construction. Some bricks may be temporarily left out at the ground floor level to form openings to permit the bottom of the cavity to be cleared of mortar droppings at the end of each day’s work. 6. In exposed positions, it is desirable to leave a few vertical joints in the outer leaf open, at the bottom of the cavity to permit water to drain away. 7. A certain amount of ventilation to the cavity is desirable to prevent stagnation of air and excessive humidity. It can be provided by vents, say 150 x 75 mm (6″ x 3″) at intervals, near the base and top of the wall, by leaving a few joints open. 8. The cavity walls should not be built solid at the jambs [the sides of door and window openings] unless a vertical “damp-proof course” is inserted to prevent water driving to the inner face. Thus solid jambs without DPC are only permissible in fairly sheltered sites and where the wall surface is rough-cast. 9. A lead, galvanized iron or other suitable material made to form a trough or gutter, may be placed in the cavity above all openings for exposed doors and window to collect water which may drive through the outer leaf. 10. The cavity wall should not be built solid below window sills also, and a damp-proof course is desirable at this point also. 1. Cavity walls are best for damp prevention than solid building walls. 2. They work best as heat insulators; it can decrease heat transmission from the outside environment. 3. Sound waves travel faster in solid walls as compared to hollow walls. Hence, the cavity walls are also best for sound insulation. 4. The construction cost of the cavity wall is about 20% less than the construction of solid walls. Hence, they are also economical. 1. Highly skilled labor and masons are required for cavity wall construction. 2. Require standard supervision during its construction. 3. A vertical damp proof course is also necessary for it. Thanks for Reading, Don’t forget to share this article. Read Also: Manufacturing of Bricks | Method, Process, Types. I think you mean…..10 cm thickness. I THINK YOU MEAN….. FILLED UP TO 15 CM below THE DAMP-PROOF COURSE .